Posted by Advocate Kunal AhujaPosted on January 29, 2019 February 19, 2019 2 Comments on Execution of RERA OrdersCategories Debt Recovery Management, RERA ConsultingTags bankruptcy, category of the financial creditors, execution of RERA orders, insolvency, Insolvency and Bankruptcy Code, NCLT under IBC, Top IBC Professionals, What will happen under IBC? Real Estate (Regulation & Development) Authority has rightly recognised the rights of the homebuyers and provided necessary relief to the home buyers efficiently. Either by passing the orders directing the builder to completely refund the whole amount along with the interest or directing the builder to deliver the possession of the project within the prescribed time. All of their struggle has become fruitful in the end where they finally received the necessary orders. Homebuyers might have received the orders in their favor but are these orders really helpful for them. The orders passed by the RERA authorities on paper are totally doing justice in favor of the homebuyers. However, just getting the orders from the RERA authorities is of no use when the aggrieved homebuyers cannot get the orders executed. The execution of the orders is still a far fetched process as the RERA has failed to implement the execution mechanism under the RERA. Owing to which most of the homebuyers are still at the same position where they were before enactment of RERA. The major reason for the such hurdles and complications arising is the lack of proper implementation of execution of RERA orders. 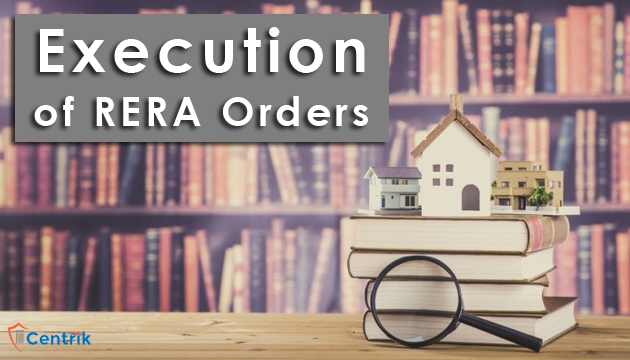 The execution of the orders passed by RERA authorities are still ambiguous with respect to the jurisdiction and the mechanism to be adopted by the executing authorities. Now, many homebuyers are still facing so many issues even after they fought bravely and have successfully received the orders in their favor. Is there any end to their problems? Firstly, homebuyers have to understand the fact that the execution of their orders might not be possible under RERA but they can definitely exercise their rights under other laws. Through the amendment dated 6th June, 2017 in Insolvency and Bankruptcy Code, 2016 (IBC), the homebuyers have been included in the category of the financial creditors. After receiving the status of financial creditor, the homebuyers can very well get their orders executed by approaching NCLT under IBC. Under IBC every creditor has to just prove two essentials before approaching NCLT i.e. Debt amount to rupees one lakhs or more. Default meaning thereby the corporate debtor failed to fulfill their obligation or in repaying the amount of debt. Once the homebuyers have received the RERA orders they have got the certified debt which is owed to them by the builder/developer and now if the builder does not comply with the same order within the prescribed time period, then the homebuyer can approach NCLT under section 7 of the IBC to commence the Corporate Insolvency Resolution Process (CIRP). What will happen under IBC? Under IBC the whole procedure has to be followed in a time bound manner and even the CIRP has to be completed within 180 days or maximum by 270 days. Thus, under IBC, homebuyers can recover their amount in a time bound manner without any inordinate delay. Once an application gets admitted the CIRP shall be initiated and an Interim Resolution professional (IRP) shall be appointed to take over the whole management of the corporate debtor /developer’ company. Thereafter, the IRP shall make the public announcement and invite the claims from the creditors. It is to be understood that the IBC has been enacted to provide a timely relief to all the creditors. All the creditors including home buyers shall raise their awareness and proceed towards the NCLT under IBC so so to get the justice in a time bound manner.